For any of you that haven't been keeping up with NOAH in the last few years, the names KENTA and Marufuji probably don't mean much to you. Two of the brightest young stars in Japan, KENTA and Marufuji teamed together in 2003 and entered the tournament that summer to crown the first ever GHC Jr. Heavyweight Tag Team Champions. In the finals of the tournament, KENTA and Marufuji defeated the legendary Jushin "Thunder" Liger and Takehiro Murahama to become the first pair to hold the titles. For almost two full years, KENTA and Marufuji defended the titles against all comers. They also won the Differ Cup Tag Team Tournament in May of 2005, as they went undefeated as a tag team from July 16th, 2003 to June 5th, 2005. While all great things must end, it is unlikely that another young pair will dominate the tag ranks for so long in NOAH as Marufuji and KENTA did. 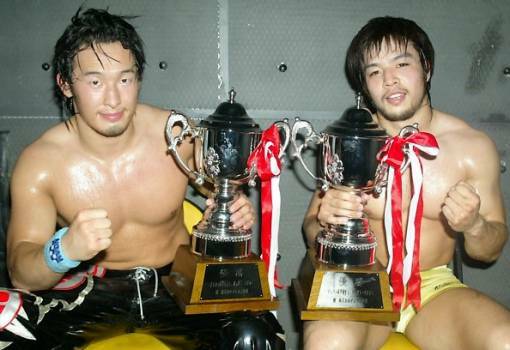 At Green Destiny, KENTA won the Jr. Heavyweight of the year in 2004 (with Marufuji coming in second) and together they were voted the tag team of the year in NOAH as well as being voted as having the best tag team match in 2004. KENTA and Marufuji were also voted Tag Team of the Year by The Wrestling Observer in 2004. Now, KENTA has moved on and won the GHC Jr. Heavyweight Championship in July of 2005 while Marufuji has teamed with Minoru Suzuki in the heavyweight division, together winning the GHC Tag Team Championship in June of 2005. In early 2003, Marufuji returned from an injury and was almost immediately paired with KENTA. Quickly gaining popularity with the crowd, Marufuji and KENTA showed early signs of progress. On June 6th, 2003, they would face Kanemaru and Sugiura. These wrestlers were no strangers to each other and had wrestled in singles matches and other tag matches against each other many times. Kanemaru had recently lost his GHC Jr. Heavyweight Championship, a belt he won when he defeated KENTA in a tournament to crown the new champion, and he aimed to defeat KENTA again. A crazy brawl starts the match, with Kanemaru and Marufuji taking it outside with KENTA and Sugiura staying in the ring. Dropkick by KENTA, but Sugiura fires back with a shoulderblock. KENTA is back on his feet quickly though and they trade forearm shots and kicks. KENTA kicks Sugiura to the mat, Kanemaru comes in, and KENTA boots him down as well. Sugiura and Kanemaru regroup on the outside, and eventually Sugiura gets back in the ring to be the legal man. They circle each other, tie-up, arm wringer by Sugiura, KENTA reverses it, applies a hammerlock, reversed by Sugiura, reversed again, and KENTA gets Sugiura on the mat. Knees to the arm by KENTA, Sugiura gets back to his feet, but KENTA tags in Marufuji while Sugiura tags in Kanemaru. Tie-up, and Marufuji hits a pair of hiptosses. Headscissors by Marufuji, Kanemaru quickly gets out of it, both men miss dropkicks, and they face off once again. Tie-up, arm wringer by Kanemaru, Marufuji flips around to reverse it, Kanemaru does a single leg takedown, and he applies a leg submission hold on the mat. Marufuji goes for a cross armbreaker to get out of the hold, but he can't get it locked in. Kanemaru tags in Sugiura, who pounds Marufuji in the back. Irish whip by Sugiura and he hits an elbow to the chest. Cover, but it only gets a two count. Sugiura applies a reverse chinlock and digs in, Marufuji slowly gets to his feet and gives Sugiura a back suplex, but Sugiura keeps the hold on. Marufuji gets to his feet again and gets Sugiura into the corner before giving him a back kick. Sugiura doesn't appreciate that much and the two trade slaps and forearm shots. A kick by Marufuji gives him the upperhand and he tags in KENTA. Kicks by KENTA in the corner and he rams his boot into Sugiura's face. Snapmare by KENTA and he kicks Sugiura in the back. Cover, but it only gets two. KENTA applies a reverse chinlock to Sugiura, but Sugiura punches out of it and delivers a stiff Alabama Slam. Sugiura tags in Kanemaru, Kanemaru puts KENTA into the tree of woe and dropkicks him in the face. Irish whip by Kanemaru, scoop slam, he then goes up top and hits a Frog Splash. Cover, but KENTA kicks out. Back up, Kanemaru goes for a vertical suplex, but KENTA reverses it into one of his own and tags in Marufuji. Irish whip by Marufuji, and he nails a dropkick. Cover, but Kanemaru kicks out at two. Marufuji applies a front facelock, but Kanemaru punches out of it and hits an uppercut. Kanemaru tags in Sugiura, who forearms Marufuji in the face. Irish whip, but Marufuji catches the ropes. Sugiura charges Marufuji, but Marufuji sidesteps out of the way and Sugiura sails out of the ring. Sugiura gets back on the apron, Marufuji goes off the ropes and goes for a sunset flip powerbomb over the top rope, but Kanemaru runs over to stop Sugiura from going over and Sugiura kicks Marufuji in the head to get out of his grip. Sugiura picks up Marufuji and Irish whips him into the guardrail. After throwing Marufuji back in the ring, Sugiura goes for the cover, but it gets a two count. Kanemaru is tagged in, snapmare by Kanemaru and he applies the Camel Clutch. KENTA gets in the ring, so Kanemaru breaks the hold before he is kicked. Irish whip by Kanemaru on Marufuji, but Marufuji kicks Kanemaru when he goes for a back bodydrop. Kanemaru hits a forearm, but Marufuji gets him to the mat with a drop toehold followed by a quick dropkick to the head. Match Thoughts: A pretty simple match, remember that this match took place on the first half of the card, but the intensity of the match and the crowd's reaction to it made it seem more important then it probably was at the time. The shortest match on the disk, they did not have the full time to develop a story but did the best with what they had. Both Marufuji and KENTA went for their finishers at different times in their match, but Kanemaru pretty much destroyed KENTA with two Deep Impacts and a brainbuster, leaving little doubt that he was the dominate wrestler in the match. At the time it took place he was higher on the totem pole then KENTA, although obviously in the meantime that has changed. The tournament to crown the first Jr. Heavyweight Tag Team Champions began on July 6th, 2003. Many argue that these belts were made specifically with KENTA and Marufuji in mind, since they were so popular with the crowd and would seem more legitimate with belts around their waists. In the first round, KENTA and Marufuji made short work of Tsuyoshi Kikuchi and Mitsuo Momota, two of the older Jr. Heavyweights in Japan, when Marufuji hit the Shiranui on Momota. In the second round, KENTA and Marufuji defeated Tatsuhito Takaiwa & Yoshihito Sasaki, this time with KENTA getting the pinfall. On July 13, the finals took place, where KENTA and Marufuji would meet the great Jushin "Thunder" Liger and his tag team partner Takehiro Murahama. The winners of this match will become the first ever GHC Jr. Heavyweight Tag Team Champions. KENTA and Murahama start things off. They both open with kicks, but neither can hit cleanly. Murahama catches one of KENTA's kick and snaps off a quick capture suplex. KENTA is up quickly though, and runs over to the side of the ring to give Liger a quick kick. Pissed, Liger charges into the ring, but the referee gets him back out. Snapmare by Murahama on KENTA and he kicks him in the back, but KENTA gets back up and the two trade chops. Stiff kick to the head by Murahama and he tags in Liger. Liger picks up KENTA, throws him back into the opposite corner, and tells Marufuji to tag in. Marufuji obliges, tie-up, waistlock by Marufuji, but Liger immediately gets free. Another tie-up, side headlock by Marufuji, Liger Irish whips out of it, but the two collide with neither man budging. Marufuji motions for Liger to go off the ropes, he does, leapfrog by Marufuji, but Liger stops behind him and nails a shotei. Marufuji rolls out of the ring, and Liger floors him with a baseball slide. Marufuji slowly gets back into the ring, kick to the gut by Liger and he tags in Murahama. Stiff kicks by Murahama to Marufuji's chest and stomach, scoop slam, and Murahama kicks Marufuji in the midsection. Murahama goes for a single leg, but Marufuji hits a reverse enzigieri to get free of the hold. With both men back up, headbutt by Murahama, but Marufuji fires back with headbutts of his own, knocking Murahama to the mat. Scoop slam by Marufuji and he tags in KENTA. KENTA picks up Murahama and kicks him stiffly in the chest, knocking him back down. Stomps by KENTA, but Murahama returns with his own kicks. Murahama finally gets KENTA to the mat, Murahama grabs onto his leg and makes the tag to Liger. Chops by Liger in the corner, and he chokes KENTA with his boot. Liger tags Murahama back in, double Irish whip, and they hit a double shoulderblock. Murahama applies a modified cross-face chicken wing and reverts it in an armbar, but KENTA gets a foot on the ropes. Kicks to the chest by Murahama, but KENTA pushes him down and throws him out of the ring. KENTA goes for a pescado, Murahama moves, but KENTA lands on his feet and when he is kicked by Murahama he is able to return fire. After kicking Murahama over the guardrail, Liger runs in as KENTA gets back in the ring, but Marufuji cuts him off. Meanwhile, KENTA goes to the ropes and hits a springboard plancha from inside the ring over the guardrail down onto Murahama. Liger and Marufuji trade shots on the outside, but Liger misses a strike and falls over the guardrail. Marufuji hits a quick super kick, pulls the guardrail out a little, goes back up on the apron, and nails a killer Asai Moonsault over the rail onto Liger. KENTA has gotten Murahama back into the ring, cover, but it gets a two count. A headscissors is applied by KENTA, he releases the hold and puts Murahama in the tree of woe in his corner while tagging in Marufuji. Kicks by KENTA, then he backs off so that Marufuji can hit a double springboard dropkick from the apron. Murahama falls out of the tree of woe, cover, but Murahama is too close to the ropes. Scoop slam by Marufuji, he hits a running splash, cover, but again it gets two. Marufuji applies a reverse chinlock, but Murahama gets a foot onto the ropes. Kick by Marufuji, Murahama fires back with chops, but Marufuji takes Murahama down with a double leg and hits mounted slaps to the face. Marufuji gets on top and applies a reverse chinlock, but Murahama quickly gets a foot onto the ropes. Marufuji knocks Liger off the apron (he just got back) and tags in KENTA. Kicks by KENTA in the corner and he stands on Murahama's shoulders. Snapmare by KENTA, he goes out to the apron and hits a slingshot legdrop. Cover, but Murahama kicks out at two. KENTA applies a submission hold, but Murahama is too close to the ropes. Stomp by KENTA, Irish whip, but Murahama grabs the ropes to stop his momentum. KENTA charges him, but Murahama back bodydrops him out to the apron and then knocks KENTA down to the floor. Marufuji bounces off the far ropes and flies over the top turnbuckle with a somersault tope suicida. Marufuji comes over, but Murahama Irish whips him into the guardrail and throws KENTA back into the ring. Kick to the chest by Murahama and he tags in Liger. Liger comes off the top turnbuckle with a splash, cover, but it only gets a two count. Liger picks up KENTA and hits a great powerbomb, cocky cover, but he gets up when he sees Marufuji run in the ring. KENTA seems out, the referee checks on him, but Liger applies the Romero Special. Murahama runs in the ring to cut off Marufuji, throwing Marufuji from the ring. Marufuji does eventually get in the ring though and dropkicks Liger in the face to break up the hold. Liger is relentless though and applies a camel clutch, while Murahama comes in and kicks KENTA in the chest while he is still in the hold. KENTA makes it to the ropes and Liger tags in Murahama. Murahama applies a leg submission hold, but KENTA inches to the ropes and gets a hand on one for the break. Murahama then applies a modified figure four leg lock, but again KENTA gets a hand on the ropes. Liger is tagged back in, he picks up KENTA and forearms him in the back. Another forearm by Liger, Irish whip, and he applies the abdominal stretch. Roll-up by Liger, but Marufuji runs in to break it up. Marufuji over-stays his welcome though, and after taking a few kicks, Liger chucks Marufuji out of the ring onto the rampway. Liger goes back to KENTA and tags in Murahama. Kick in the corner by Murahama, he picks up KENTA and hits a series of kicks to the chest. Murahama goes off the ropes, but KENTA catches him with a kick to the head. Both men are wobbly on their feet now and they connect with simultaneous kicks to the head, knocking both to the mat. Murahama makes the tag first to Liger, and Liger runs over to knock Marufuji from the apron before KENTA can make the tag. Irish whip by Liger to the corner and he nails a shotei. Another Irish whip, and Liger delivers the Fisherman's Brainbuster. Cover, but it only gets a two count. Liger applies a waistlock, reversed by KENTA, but Liger elbows out of it. Liger charges KENTA while KENTA is in the corner, but KENTA gets a foot up and then hits a tornado DDT that lands Liger's neck across the top rope and KENTA on the apron. KENTA then re-enters the ring with a missile dropkick on Liger, and tags in his partner Marufuji. Marufuji is immediately floored by a drop toe-hold, but he returns the favor with a drop toe-hold of his own. He goes to dropkick Liger in the head while he lays on the mat, but Liger wisely moves out of the way. Match Thoughts: Well that was simply a great match. In case you were wondering, Marufuji does not do the SSP very often (this is the first time I have seen him do it), and he was obviously pulling out all the stops to pick up the victory. While KENTA and Marufuji were huge in this match, Liger was the one that made the match truly memorable. Almost everything that KENTA and Marufuji threw at him, Liger had a counter. Leapfrog by Marufuji? Liger slams on the breaks and drills him with a shotei. Marufuji is the hot man? Liger does a quick drop toehold. Marufuji goes for a diving hurricanrana? Liger catches him with a powerbomb. Marufuji goes for the dropkick across the ring? Liger knocks him off with a Liger Kick. I could go on, but the point is that Liger did the little things that made it look like he really had scouted Marufuji and KENTA and was prepared for anything the team threw at him. Course, in the end Liger is knocked out from Busaiku Knee Kick and as soon as Murahama is singled out, he is overwhelmed and defeated. Back to KENTA and Marufuji, since that is what this disk is all about. In the beginning of the match, they showed their high flying abilities as within seconds of each other they took dives from inside the ring over the guardrail. Marufuji's was particularly amazing as he did an Asai Moonsault from the top rope instead of the second to give himself more distance on the backwards springboard. But they are about more then high flying moves. It was the middle of the match that really defined them here, as they did a great job selling and hit every one of their moves crisply. From KENTA's missile dropkick to Marufuji's super kick, it was possible to suspend reality for a moment and just enjoy the match without noticing little mistakes here and there. Their selling was great as well, with Marufuji looking totally out of it after the double brainbusters by Liger. The ending was really hot, with the crowd strongly cheering on KENTA and Marufuji and the four went non-stop the last several minutes until the perfect ending. Big matches that end with big moves just makes sense, and it makes it seem worth the while that we sat through a 25 minute match to see the teams hold nothing back at the end. After defeating Liger and Murahama, KENTA and Marufuji would defend their new titles against Yoshinobu Kanemaru and Makoto Hashi. Full time NOAH wrestlers, Kanemaru and Hashi had beaten Naomichi Marufuji and Mitsuo Momota a few days before the match, and Hashi had picked up a pinfall victory over KENTA at the beginning of the tour in a tag team match. On September 12th, 2003, the teams would meet at the big Budokan show as KENTA and Marufuji would face their first test as GHC Jr. Heavyweight Tag Team Champions. This match is for the GHC Jr. Heavyweight Tag Team Championship. KENTA and Hashi start things off and trade boots to the face. A kick to the face by Hashi knocks KENTA down, Irish whip, but KENTA knocks Kanemaru off the apron and all four men come in the ring, pushing and shoving until the referee restores order. They circle each other, tie-up, Irish whip by KENTA, and he hits a forearm to the face. Hashi is back up quickly, but KENTA kicks him in the stomach. Hashi goes off the ropes and hits a forearm followed by a Mongolian chop, but KENTA knocks him down and dropkicks him in the head while he lays on the mat. KENTA tags in Marufuji while Hashi tags in Kanemaru. Quick drop toehold by Marufuji, he goes for a dropkick, but Kanemaru moves out of the way. Kanemaru goes off the ropes and knocks Marufuji to the mat, goes off the ropes again, Marufuji does a kip-up and a leapfrog, a reverse leapfrog, Marufuji avoids a Kanemaru springboard moonsault off the second rope, but Kanemaru still manages to hit a hiptoss. Marufuji reverses it into a headscissors, Kanemaru quickly gets out of it, both men go for dropkicks, but both come up empty and the two square off once again. Tie-up, Marufuji pushes Kanemaru into the ropes, forearm by Kanemaru and he applies an arm wringer, but Marufuji flips off the ropes to reverses it. Arm bar by Marufuji, Kanemaru tries to hiptoss out of it, but Marufuji lands on top and maintains the hold. Marufuji tags in KENTA, kicks by KENTA, and he elbows Kanemaru in the arm. Kanemaru sneaks in a forearm shot though, dropkicks KENTA to the mat, and tags in Hashi. Kick to the gut by Hashi and a hits a couple of shots, but KENTA fires back with kicks to the head and chest. Hashi absorbs and hits a series of Mongolian chops though, sending KENTA to the mat. Cover by Hashi, but it only gets two. Hashi picks up KENTA and headbutts him to the mat, continuing the headbutts after KENTA has fallen. Cover again, but again it gets two. KENTA sneaks in a forearm and tries to fight off Kanemaru too, but he is overwhelmed by the team and Hashi regains the advantage. Hashi goes for a suplex, but KENTA reverses it into a vertical suplex of his own. Cover, but it only gets a two count. KENTA tags in Marufuji, Irish whip by Marufuji and he hits a high dropkick. Cover, but Hashi kicks out. Kicks to the leg by Marufuji and he applies a leg submission hold. Hashi eventually gets to the ropes and Marufuji breaks the hold. Marufuji drapes Hashi's leg over the bottom rope and jumps down on it. After dragging Hashi to the middle of the ring, Marufuji applies another submission hold and slaps Hashi in the face. Hashi tries to fight out of it, can't, but he does get to the ropes. Marufuji tags in KENTA, who kicks Hashi repeatedly in the leg and applies a submission hold of his own. Hashi headbutts his way out of this one, but KENTA stays on the attack. Kick to the leg by KENTA and he tags in Marufuji. After they make a wish with Hashi's legs, Marufuji picks up Hashi and throws him in the corner, where he continues kicking his leg before dropkicking it. Irish whip by Marufuji, but when he charges he eats a boot and Hashi comes off the top with a double ax handle. Hashi tags in Kanemaru, who hits a spinning elbow strike on Marufuji and knocks KENTA off the apron. Irish whip by Kanemaru on Marufuji and he hits a big back bodydrop. Cover by Kanemaru, but it gets a two count. Elbow to the back of the head by Kanemaru, he goes for a vertical suplex, but Marufuji reverses it into his own vertical suplex and tags in KENTA. Kick to the chest by KENTA and he rains in the kicks in the corner. KENTA hits a few knees and stands on Kanemaru's chest while using the ropes to add extra pressure. Irish whip by KENTA, reversed, but KENTA gets his foot up when Kanemaru charges. KENTA then performs a tornado DDT that lands him out on the apron, but Kanemaru hits a forearm shot before KENTA can springboard himself back in. With KENTA still on the apron, Hashi goes over to him and nails an inverted DDT, dropping both to the floor. Hashi picks up KENTA and Irish whips him hard into the guardrail before sliding him up onto the ramp where Kanemaru is waiting. Kanemaru then picks up KENTA and scoop slams him from the ramp down to the floor at ringside. Hashi throws KENTA back into the ring and stays in as legal. Hashi and KENTA trade slaps, but Hashi wins the duel and knocks KENTA off his feet. Cover, but it only gets a two count. Hashi tags in Kanemaru, and Kanemaru applies a crab hold while KENTA's legs are wrapped inside the ring ropes. Kanemaru tags in Hashi, and Hashi applies the same hold. Kanemaru then bounces off the far ropes and dropkicks KENTA in the face while he is in the hold. Cover, but it gets a two count. Hashi chucks KENTA from the ring and gives him a backbreaker. He then gets up on the apron and nails a diving headbutt. Marufuji finally comes over to help, but he gets Irish whipped into the guardrail and Hashi puts KENTA back in the ring. Hashi tags in Kanemaru and Kanemaru applies a crab hold in the middle of the ring. KENTA gets a hand on the ropes though and Kanemaru breaks the hold. Kanemaru drags KENTA up, KENTA tries to forearm his way back to his corner, but gets knocked down by a boot to the face. Kanemaru tags in Hashi, Headbutt by Hashi, Irish whip from the corner, but KENTA gets his foot up when he charges. Hashi still hits a Mongolian chop though and goes for a lariat, but KENTA kicks him in the arm and delivers an enzigieri. This gives him time to tag in Marufuji, Irish whip by Marufuji, reversed, Kanemaru kicks Marufuji from the apron, but Marufuji turns around and dropkicks him. Hashi charges Marufuji, but Marufuji back bodydrops him over the top rope down to the floor. Marufuji then runs from the far side of the ring and hits a corner double springboard somersault tope suicida on both men. Marufuji gets back in the ring and grabs Hashi back in, he goes for a suplex over the top rope, but Hashi blocks it and hits a shoulderblock. Hashi gets back in the ring and charges Marufuji, but Marufuji hits a drop toehold and dropkicks Hashi in the head while he lays on the mat. Cover, but it only gets a two count. Back up they trade forearm shots and other strikes, but Marufuji gets Hashi to the mat and applies an armbreaker. Kanemaru quickly breaks up the hold, Marufuji applies a waistlock, reversed by Hashi, Hashi goes for a German suplex, but Marufuji lands on his feet and hits a superkick. Hashi fires back with a lariat though and tags in Kanemaru. Irish whip by Kanemaru, reversed, and Marufuji hits a jumping elbow smash. Marufuji puts Kanemaru on the top turnbuckle and goes for a hurricanrana, but Kanemaru pushes him off and delivers a diving headscissors. Kanemaru then immediately climbs up himself and nails the Hollywood Star Press. Cover by Kanemaru, but it gets a two count. Kanemaru picks up KENTA and goes for a brainbuster, Marufuji goes for a Shiranui, but Kanemaru pushes him off and rolls him up for two. Marufuji then rolls up Kanemaru, but he also only gets two. KENTA and Marufuji both looked solid here and were the stars of the match, which is fitting since at the time they were young champions with a new belt that needed strong champions to make the crowd accept it as legitimate. While one could argue that "ring psychology" was virtually non-existent, it very rarely comes into play in Jr. Heavyweight tag team matches. They tend to be more of a display of athletic ability, speed, and deadly strikes, categories that KENTA and Marufuji have no trouble in delivering. KENTA's kicks were dead-on and Marufuji flew around with great accuracy, which is why the pair were on such a hot streak when they started their run back in 2003. After their match on September 12th, 2003, the champions did not wait long to defend their new belts once again. For the main show of the very next tour, KENTA and Marufuji would face off against Luchadores Juventud Guerrera and Josh Barnett's boy Ricky Marvin on November 1st, 2003 for the GHC Jr. Heavyweight Tag Team Championship. This match is for the GHC Jr. Heavyweight Tag Team Championship. They brawl to start the match, Irish whip by Juvy on Marufuji and he dropkicks him out of the ring. Marvin then does a plancha suicida off the side rope down onto Marufuji from inside the ring while Juvy goes out on the apron and delivers a missile dropkick to KENTA. KENTA kicks Juvy back, but Juvy ducks one and clotheslines him to the mat. Marvin rejoins Juvy, double Irish whip, and Marvin catapults KENTA to Juvy and Juvy nails a powerbomb. They then hit double 619s to KENTA, Marufuji tries to help, but Juvy chucks him from the ring. Double Irish whip to KENTA, but KENTA kicks down both men and hits a brainbuster on Juvy. Cover, but Juvy kicks out. Marufuji is back by now, they set their opponents up in the corners and Irish whip them into each other, Juvy and Marvin flip around each other and charge Marufuji and KENTA, but KENTA and Marufuji see them coming and toss them into the corner again. Marvin gets KENTA out onto the apron and charges Marufuji, but Marufuji knocks him down with a super kick. Juvy then charges Marufuji, but Marufuji ducks out of the way and KENTA comes flying off the top turnbuckle with a crossbody. Cover, but it only gets a two count. KENTA grabs Juvy while Marufuji grabs Marvin, double Irish whip, both get reversed, Marufuji and KENTA both deliver a sunset flip, but Juvy and Marvin roll through their respective sunset flips and dropkick KENTA and Marufuji in the face. KENTA and Marufuji both roll out of the ring, Juvy and Marvin both fake dives but end up posing for the crowd instead. Juvy leaves the ring, and we have Marvin against KENTA. Marvin tags out though, so Juvy takes his place. They trade kick attempts with neither man really connecting, a side headlock is applied by Juvy, KENTA Irish whips out of it, but Juvy shoulderblocks him down. Juvy goes off the ropes, bypasses KENTA several times, but gets his legs swept from underneath him. Juvy returns the favor, KENTA gets back up, Juvy kip-ups, and both men are back on their feet. Juvy poses for the crowd, and while he is doing that he gets kicked right in the head by KENTA. Cover by KENTA, but Juvy kicks out. Juvy rolls out of the ring to regroup, and Marvin helps him back in. Marvin tags into the match and Marufuji asks for the tag as well, which he gets. Tie-up, side headlock by Marvin, Marufuji Irish whips out of it, but Marvin hits a handstand springboard elbow strike. Irish whip by Marvin, reversed, Marufuji goes for a back bodydrop, Marvin lands on his feet, but Marufuji clotheslines him to the mat. Cover by Marufuji, but Marvin kicks out at two. Irish whip by Marufuji to the corner, but Marvin does a double springboard up to the top turnbuckle and hits a hurricanrana, sending Marufuji from the ring. Juvy then hits a running bulldog from the apron on Marufuji, planting him to the floor. Chop by Juvy on the outside and he throws Marufuji back into the ring. Cover by Marvin, but it only gets a two count. Marvin applies a unique submission on the mat, but KENTA comes in and breaks it up. Marvin puts Marufuji up in the tree of woe in the corner, gets a running start, and dropkicks him right in the face. He then runs back and tries again, but Marufuji lifts himself up and Marvin slides into the ring post. KENTA then jumps to the outside and pulls on Marvin's legs, applying pressure to his groin. Juvy comes over to help, but KENTA throws him into the ring post. Marufuji tags in KENTA, snapmare, and he kicks Marvin in the back. Cover, but it only gets a two count. KENTA applies a reverse chinlock, but Marvin gets a foot on the ropes and KENTA gives the break. Back on their feet KENTA kicks Marvin and tags in Marufuji. Marufuji stomps Marvin down in the corner and chokes him with his boot. Marufuji continues kicking Marvin in the corner, picks him up, scoop slam, and he gives Marvin a running splash. Cover, but it only gets a two count. Marufuji applies a reverse chinlock with a bodyscissors, but Marvin makes it to the ropes. Stomp to the back by Marufuji, he picks up Marvin and tags in KENTA. Snapmare by KENTA, he goes out to the apron and hits a slingshot knee drop. Marufuji then flies over with a slingshot elbow drop, cover, but it only gets two. Back up, KENTA hits a series of kicks, but Marvin grabs his ankle and applies an ankle lock. KENTA almost makes it to the ropes, but Juvy comes flying out of nowhere with a dropkick to KENTA's face. Cover by Marvin, but it gets a two count. Juvy comes in the ring, double Irish whip, double drop toehold, and they hit a double dropkick to the head of KENTA. Cover by Marvin, but again it only gets a two count. Marvin applies an STF into a stretch hold, but Marufuji comes in the ring and Marvin releases the hold. Marvin pushes KENTA back into the corner and tags in Juvy. Chop by Juvy, and another one knocks KENTA to the mat. Juvy picks up KENTA and goes for a powerbomb, KENTA reverses it with a rana, but Juvy pushes him over for a two count roll-up. Back up, KENTA goes on the offense, but again Juvy rolls him up for a quick two count. Double leg takedown by KENTA, he lays on top of Juvy for a pin attempt, but Juvy bridges out of it and goes for a backslide, but KENTA gets out of it. Waistlock by KENTA, Juvy elbows out of it and goes off the ropes, KENTA goes for a German suplex, but Juvy lands on his feet. Juvy goes for the Juvy Driver, KENTA slides down his back and goes for a back suplex, but Juvy lands on his feet and delivers the Complete Shot. Juvy applies a submission hold while Marvin takes care of Marufuji, but KENTA eventually gets a foot on the ropes. Juvy tags in Marvin, Double Irish whip from the corner, Marvin hits a jumping clothesline and then gets on all fours so Juvy can hit the Poetry in Motion. Marvin applies the Mexican Surfboard roll to KENTA and then applies the Romero Special, but Marufuji breaks it up. Marvin pushes KENTA into the corner and hits forearm strikes, but KENTA fires up and changes positions with him, kicking Marvin in the chest. Marvin absorbs the blows though and clotheslines KENTA, cover, but it gets a two count. Irish whip by Marvin, reversed, but Marvin dropkicks KENTA in the knee and hits an over-the-shoulder neckbreaker. Cover, but KENTA kicks out. Marvin picks up KENTA, they trade blows, KENTA applies a sleeperhold, but Marvin hits a back suplex to get out of it. Irish whip by Marvin to the corner, but KENTA avoids the charge. KENTA goes for a backdrop suplex, but Marvin lands on his feet, goes off the ropes, but KENTA catches him and delivers a powerslam. KENTA tags in Marufuji, Marufuji grabs Marvin's arm, and as Juvy comes in the ring Marufuji hits a springboard dropkick/armdrag combination on Marvin and Juvy. Marufuji ducks a Marvin clothesline, Irish whip, reversed, but Marufuji bodydrops Marvin to the apron. Marvin lands on his feet and fights off Marufuji, and while he is still on the apron KENTA runs over to get his shots in, but Marvin fights him off as well and then hits a springboard hurricanrana from his side of the apron to the other, sending KENTA hard to the floor. He quickly gets back on the apron and goes for a springboard spinning heel kick on Marufuji, but Marufuji catches him in the face with a dropkick. Match Thoughts: This was a completely different match then the other two on the disk thus far, which is mainly because they were wrestling two Lucha Libre wrestlers and adopted a lot of the flashy style that some Lucha Libre matches have. Forget ring psychology and "story telling" in this match, it was more focused on delivering big spots and memorable moments. It was successful in that regard for the most part and the crowd was extremely into the match. The criticisms first. As I mentioned above, there really wasn't a story being told in this match besides that both teams had a lot of experience together and fed off each other very well. The double team moves incorporated throughout the match were well done, but there wasn't the usual wearing down of one opponent, hot tags, or long term selling that you sometimes see in tag matches. As I mentioned before, Jr. Heavyweight tag matches don't usually have a lot of that, but this match pretty much had none. Also, a lot of the "big spots" looked really contrived (like why exactly did Marufuji climb on Marvin's shoulders while he was on the top turnbuckle? ), but 95% of the time the spot was hit well which was all they were going for. There were a few miscommunications, especially towards the end, but they worked through it pretty well and it wasn't too noticeable. Some of the moves looked sloppy, but it was only a couple and no spots were flat-out blown. For a 30 minute fast paced match with Juvy in it, that is quite the accomplishment. Finally, I really didn't like Juvy picking up KENTA instead of pinning him, but since Juvy paused for a good few seconds thinking, it seemed more like a miscommunication then a poor booking decision. Since the match was for a belt and not a "we want to kill them" revenge match, not going for the cover really wouldn't have made sense there. Fast forward to the spring of 2005. Over a year and a half later, KENTA and Marufuji had established themselves as the best Jr. Heavyweight tag team in the world, going undefeated during that time in title and non-title matches. They defeated every major Jr. Heavyweight team in NOAH and others from different promotions including Zero-One. But all things must come to an end, and since KENTA and Marufuji were seen as legitimate by now and were very popular with the fans, it was time for them to move on from one of the lower belts (no matter how popular they were) to more important feuds. In order to move on to greater things, they had to drop the belts that they had almost single handedly made. This would obviously be an important belt change, since the new team would be following one of the greatest title reigns by any Japanese tag team in recent memory. It only seemed fitting that the tag team that had first defeated KENTA and Marufuji back in early 2003 would be the pair to do it again, as on June 5th, 2005, Yoshinobu Kanemaru and Takashi Sugiura defeated KENTA and Marufuji for the GHC Jr. Heavyweight Tag Team Championship. As of the end of 2005, Kanemaru and Sugiura still have the belts, although they have made only one defense and it is too early to tell how successful they will be in 2006. While I probably would have called this disk "KENTA and Marufuji: The Early Years," it does a good job at showing how KENTA and Marufuji became such polished and popular wrestlers. Only five months passed between the first and last match on the set, but you can see the improvement and how the team evolved during that time. Even though the set only has four matches, they range from very solid to excellent and all are important to the teams development. The Video Quality is VG, as the matches were transferred from VHS to DVD, but the picture is clear and it doesn't jump/shake/etc. like you sometimes see on VHS videos. Overall I'd have to recommend this since KENTA and Marufuji are a great tag team, even though I wish that some matches from 2004 were included as well. Don't be surprised if another custom DVD is made with these two to show their later successes in NOAH.